One of the best parts of the Inexpensively blog network is the opportunity to connect with frugal bloggers from across the globe. We enjoyed meeting several members of Team Inexpensively & other frugal bloggers at Blissdom earlier this year, and we’re looking forward to getting together in just a few weeks! Amongst the chaos of BlogHer, enjoy a quiet breakfast to collaborate, learn and network with others, as we encourage growth across the niche. Deal & frugal blogs are a rapidly growing niche, with their own set of needs & challenges. It is such a great experience to meet people who “get” you and share your experiences. 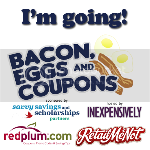 Join Red Plum, Retail Me Not and Inexpensively for a morning of learning, sharing and growing your blog. *Please note by registering for this event, you are giving permission to release your information with our sponsors and hosts to create a tailored event for all guests.